The thought of a country allowing a festival to take place for the sole purpose of slaughtering cats and dogs is horrifying, but that’s what happens each year in China at the Yulin Dog Meat Festival. But this year, 100 dogs will get a reprieve, thanks to a woman who paid $1,000 to save their lives. 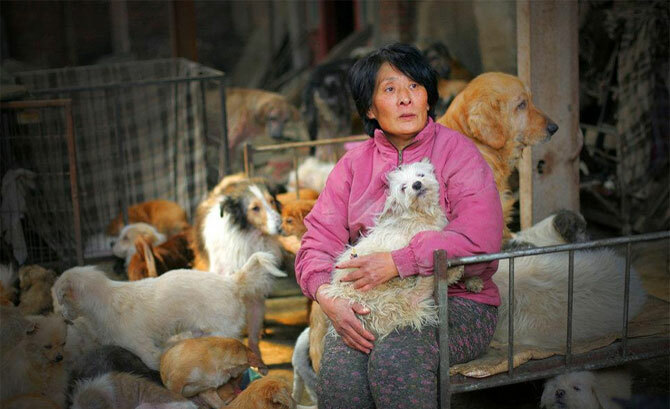 A Chinese woman has paid over $1,000 to save 100 dogs from being eaten at the Yulin dog meat festival. 65-year-old Yang Xiaoyun, who is retired, travelled 1,500 miles from her home in Tianjin to Yulin city where the festival is being held. Arriving at the market on Saturday, the animal lover paid 7,000 yuan, or $1,000, to save one hundred dogs before they could be slaughtered and sold as meat. It is estimated that around 10,000 cats and dogs will be slaughtered during the festival which takes place annually to mark the summer solstice. There has been international outcry about the festival which has been condemned as animal cruelty. Both Ricky Gervais and Leona Lewis have led calls for the event to be banned. Yang owns an animal sanctuary called ‘Common Home for All’ and first began rescuing animals in 1995 when she pulled an abandoned kitten from a river. She intends to take the 1,000 dogs from Yulin back to the sanctuary. It’s interesting that this average woman will spare $1,000 of her own money, while much wealthier celebrities like Ricky Gervais speak out against the festival but do nothing to actually save the lives of these dogs and cats. Nevertheless, at least there is one person who is willing to do what it takes to intervene and make a difference.